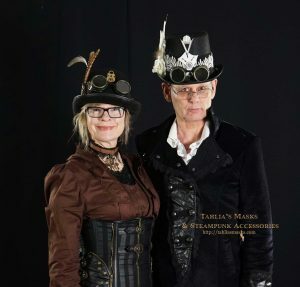 Practical comfortable steampunk fashion. It’s possible. I wear this kind of thing on a daily basis. The vest was made to order by Javed Khan at Leather Mangoa in India. The workmanship on it is stunning. If you ever want a leather jacket made to measure, contact him. The belt came from France. I got it on Etsy. 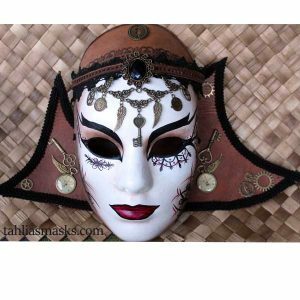 Steampunk mask comes alive. Argh. 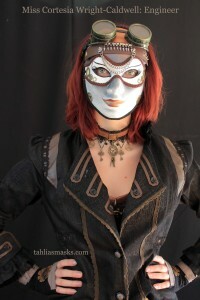 My masks are becoming real steampunk characters. 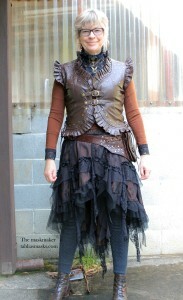 Meet Lady Charlene Dragonwood-Unsworth: Financier and airship owner.